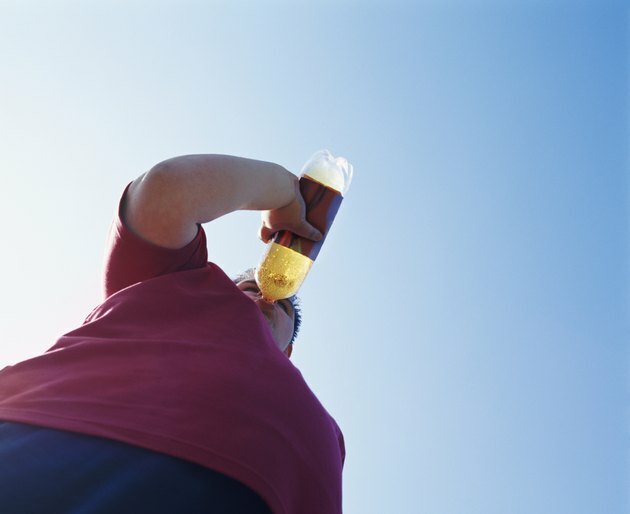 Diet sodas, including low- and no-calorie soft drinks, are sweetened with artificial sweeteners. The most commonly sweeteners are aspartame, sucralose or acesulfame potassium, all of which have diarrhea as a possible side effect. All three sweeteners are approved for use by the U.S. Food and Drug Administration. Unless you drink large quantities of soda every day, or consume large amounts of diet products or sweeteners in addition to sodas, the amount of sweeteners in soda should not cause diarrhea. Aspartame is made by combining aspartic acid and phenylalanine to produce a sweetener that is 200 times sweeter than sugar. While there may be possible side effects to taking aspartame, you would need to drink a lot of soda before your reach the tolerable upper intake of aspartame as set out by the FDA. For a 150-pound adult, the tolerable upper intake is 3,500 milligrams per day. This would be roughly 19 cans of soda, or 80 packets of aspartame. Some side effects associated with consuming aspartame include stomach problems, which may lead to diarrhea, although this is uncommon. However, if your suffer from phenylketonuria, a genetic condition, you should avoid aspartame because your body is unable to break down the phenylalanine it contains. A common side effect of phenylketonuria is diarrhea. Other symptoms include vomiting, weight loss and sensitivity to light. Because of the expense of producing it, sucralose is not a common sweetener for sodas. While diarrhea is a side effect associated with sucralose, you need to consume large quantities before you experience side effects -- upwards of 85 packets per day. Sucralose is produced by adding chlorine to sugar and, like aspartame, is much sweeter than regular sugar -- about 600 times sweeter. However, Splenda -- a brand-name sucralose -- is diluted so that it has the same degree of sweetness as sugar. While it is unlikely you will drink enough diet soda containing sucralose to cause diarrhea, if you regularly consume sucralose-containing products, such as sugar-free gum, you may experience the laxative effect of the sweetener. Acesulfame potassium, also known as acesulfame K or ace K, is 200 times sweeter than regular sugar and contains no calories. It is commonly used to sweeten no-calorie foods, including diet sodas, and is blended with other sweeteners when used in commercial food products. As with other sweeteners, you would need to consume large quantities of diet soda — roughly 20 cans — before your reach the tolerable upper intake limit of ace K. In some cases, acesulfame potassium has been associated with diarrhea when consumed in large quantities. Stevia, a no-calorie natural sweetener, is sometimes used in specialty diet sodas. It does not have a known side effect of diarrhea, even when consumed in high quantities. Unlike the other sweeteners, stevia is approved by the FDA to be used as a food supplement, not as a sweetener. Because of this, there is some concern about stevia's safety, because the regulations for supplements are less stringent. No confirmed dangers of consuming stevia in large quantities over an extended period of time have been reported, but there have been few long-term studies done on the safety of stevia on humans, as of 2014. Columbia Health: Risks of Aspartame? What Ingredient is in Coke that Causes Diarrhea?